Note: This is a series about hearing my Grandma Donna Marie Watson's voice for the first time. She died before I was born. Part I describes what I felt and thought when I heard the audio recordings. This is Part II. Travel with me for a few moments, back in time, to a place that no longer exists. It's 1979, and we're on the crisp, orderly campus of Western Michigan University in Kalamazoo. Instead of finding ourselves in a light-filled, modern, spacious, attractive facility, we walk through the doors of a dim, dingy, cinder-block building with flickering fluorescent lights and sparse furnishings. Sounds echo harshly, coldly off the cement walls as people move about and converse. We've entered a building that houses the School for the Blind, a program that no longer exists. WMU still offers a graduate degree in Blindness and Low Vision Studies, but it's geared toward training professionals to work with the blind; it's not about teaching vision-impaired people new life skills. But, in 1979, the school did exist, and my Grandma, who had lost her vision because of complications from diabetes, had enrolled. As I mentioned in Part I, My Aunt Kathleen and Dad – John – dropped her off on her first day. They were 20 and 21. Grandma was 49. The recordings, which are first and second drafts of an audio "letter" to my Aunt Kathleen, are telling to the observant listener. In the first take, I hear the instructor's voice, its gentle tone and slight Southern drawl, calmly and patiently explaining directions to Grandma about what she should do for her first try at recording a "letter." Instructor: "It's what we call a built-in microphone. You don't have to hold a microphone. You can sit there – for this kind of recording – you know, and just talk. You can do it anywhere, really. So what I'm going to have you do is make a recording home to your daughter. Or we're going to make the recording and then send it home. OK?" Grandma: "All right," she says softly, barely audibly. Instructor: "I'm going to leave you alone so you can do that. You (should) feel like you can be very relaxed with the recorder. Don't strain yourself for conversation. Pretend that your daughter is across the kitchen table from you, and you're both enjoying a cup of coffee. OK?" Grandma: "Mm-kay," very softly, very timidly. Instructor: "That way, it'll help you keep your mind off the machine and on the person you're talking to. I'm going to get up and leave you alone." Grandma: "This is all ... ready to ... ?" Instructor: "You're recording, right now." His chair scrapes the floor harshly and loudly, and the sound echoes as he stands up from the table to leave. He drifts out into the hall without closing the door behind him. We can hear someone playing music in another room. For draft one, Grandma slowly begins spinning her letter, but she is distracted by scraping/banging sounds in the room as the instructor returns to help her restart the process for draft two. Draft two is very, very special. Please, help yourself and listen to both drafts below. They're a couple minutes long apiece. I hope you'll be as enchanted with her as I have been. She sounds so fragile, so gentle, so lovable. I want to know her, I want to be on the other side of that kitchen table, savoring each sip of our coffee as we delay, delay, delay, beginning the day's work. I think we would have stood up after our coffee together, and we would have cleaned up the dishes, tidied the house, and started baking cookies, assembling lunches, continuing the sewing projects. We might have gone out to run some errands together and returned just in time to start dinner preparations. Was that what a day in your life would have been like, Grandma? When she first learned she would be recording this one-sided conversation to send to my aunt, I wonder if Grandma could have imagined that, 35 years later, her then-unborn granddaughter (me) would be listening and learning to love the grandmother she never knew. It reminds me none of us know how we'll affect the people we leave behind. As a writer, this moves and challenges me deeply. It means that I must put great care into what I create. I must infuse each line with honesty and love. I must try to think about how what I say can touch the people I love. 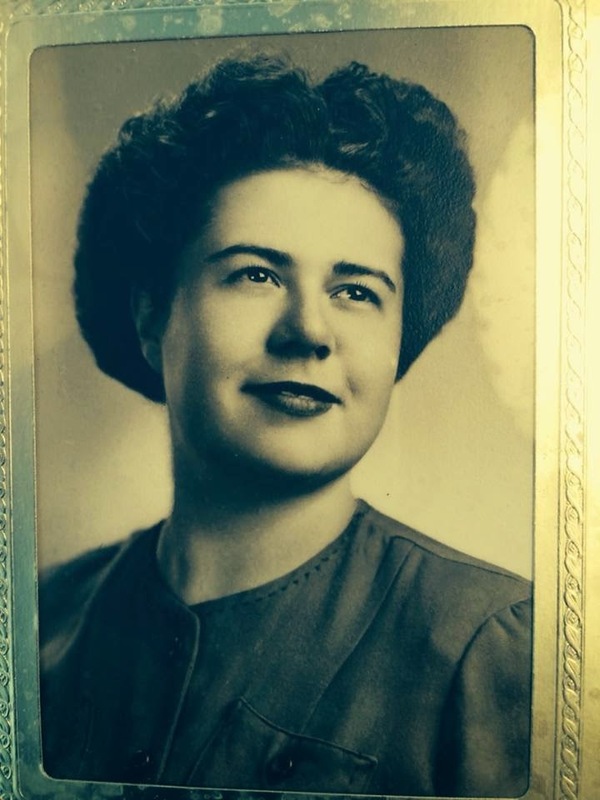 I now "remember" that my grandmother was a soft-spoken, kind, gentle woman. To me, these recordings seem to hint that she also was anxious, shy and, at times, lacked confidence in herself. I can learn from the strengths and the flaws she exhibited in these two-minute tapes. And now, because of what I've heard in her voice, I intend to sit with my aunt(s), her daughters, and learn more about Grandma. We all leave behind a legacy. What do you want your grandchildren to remember about you?